College Hoops has started and the 50 to 100 games a day will keep me busy!!! Number 2 Clemson is playing Pitt at home today. 69% of the betting is on Clemson with the line moving from -20-106 to -21.5-104. Models slightly favor Pitt, Variables slightly favor Clemson and public betting is neutral With mixed signals like this the game is a clear cut pass for me. Let me mention that big home favorites in college football in certain circumstances can have a very positive EV. This game however is not one of them. Good Luck whichever side you choose. Friday, we had 4 one unit plays and went 1-3. In the NHL we won with Dallas +137 , In college FB we lost with Boston college +21 and in our first college hoop total wagers we went 0-2 losing with Kansas under 154 and Marquette under 150. Today so far we have 2 one unit plays pending. Today is my catch up day on the spread sheets in case you have been looking at the historical results. I am only a few days behind. After a very nice run the last month or so we have settled in now with so far a small draw down. So small its hardly worth mentioning. But let it be a reminder that sports betting is no straight line upwards. Try as hard as you can there is no way to avoid draw downs. But if your bet sizing appropriately they should not cause you any concern at all. 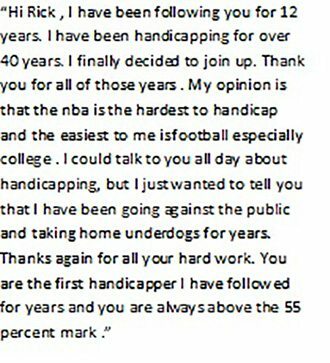 That is one of the secrets to sports betting that very few ever appreciate. 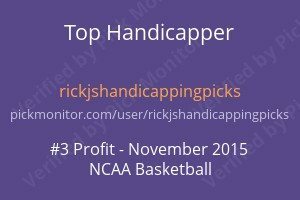 What happens when you wagering on multiple sports every day each sport takes its turn producing gains to the upside. Right now the NHL is providing us some support while we have cooled off a bit in football. The NBA holding its own. To me its very interesting to watch the ebb and flow of each sport in relation to each other. But I am an egghead type so that would most likely explain it. Shortly after 11 I will send out to Subscribers my Hilton NFL picks for this weekend. It was an interesting weekend for picks with the number of close games in the mix. I have been getting a number of emails lately regarding subscription options and college hoops. All you need do is go back a few posts where I have flayed it all out. But really its very simple. Subscribe via paypal. Pick the subscription option. You will get a 3 day free trial and if for some reason you do not wish to continue just cancel after the 3 days. During that time if you have any questions email me and I will respond back right away.